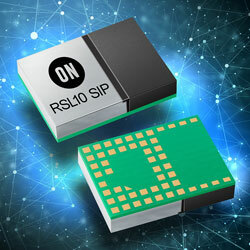 ON Semiconductor has extended its RSL10 family of Bluetooth 5 certified radio SoCs with a ready-to-use 6mm x 8mm x1.46mm SiP module. Supporting BLE wireless profiles, the devices can be simply designed into any ‘connected’ application which includes sports/fitness or mHealth wearables, smart locks and appliances. The SIP has a built-in antenna, radio, and all needed passive components in a complete, miniature solution. Certified with the Bluetooth SIG, the SIP reduces time-to-market and development costs by eliminating the need for any additional RF design considerations.